There are some really great prepared foods out on the market that can be quite hard to top. Hostess Cup Cakes for example. I know there are recipes out there to duplicate these at home, but for how long and all the effort they take to make, and taking into consideration that I can woof one of those puppies down in about 67 seconds (especially if they are frozen), this is not going to be on top of my to do list of recipes to try. Some things are definitely just easier and dare I say better bought from the store. However! And this is a big however. There are many, many, many more dishes out there that given the choice of buying them prepared from the store, in a box or from a restaurant verses making it myself, I will have to go with the homemade version. The advantages are many, including knowing exactly what is going into what I’m making, making it fresh (who knows how long some of those prepared meals have been sitting around), and let’s not get started on how great I feel when I serve my family a fresh and hot HOMEMADE meal. Some things that are better homemade are not necessarily easy or quick. In fact, I’d have to say that most of the dishes I make for dinner seem to take more time than I might actually want to spend in the kitchen, but then again this is my job. Feeding the family is by far the biggest time consumer of my homemaker job and most definitely the one I take the greatest pride in. A few weeks ago I embarked on a new dish that I have wanted to try making for more than 30 years. Time isn’t always on my side (mostly not on my side) but after trying several store-bought versions of this dish and finding they didn’t compare to homemade, I decided that homemade was the only way to go. Even restaurant versions of this dish left me not quite satisfied. So, when I had a day to spare — well it wasn’t quite a whole day, but lets say a good four hours — I set to work on making homemade potato gnocchi. Check out my post at Simply Grateful Cooking for https://simplygratefulcooking.wordpress.com/2016/03/10/homemade-potato-gnocchi/. Amazing how something with four simple ingredients can taste so much better homemade and take so much time to make. I was smart though. Seeing as I was making a mess of the kitchen anyhow, I decided to make several batches and freeze them so I wouldn’t have to have so many hours to make one meal the next time I wanted to serve them. When I’ve got the time, I have a list of recipes I go to that I want to perfect for the home because either store-bought versions are lacking or restaurant eating is just not our cup of tea. One more recipe off this list and for this I am — Simply Grateful. Hang laundry out. 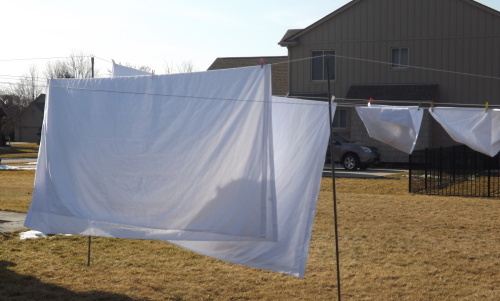 I hate not being able to hang bedding and clothes outside all winter. Not only does running the dryer cost money, but it never leaves the laundry smelling quite as good as the fresh air. Start seeds for spring planting. It’s the beginning of March and time to start planting the seeds for tomatoes and peppers. These seeds take the longest to grow and are the biggest crops in my garden. Last year winter never gave us a break so I moved my potting bench into the great room along with bags of dirt and worked on starting my seeds there. This break in the weather couldn’t have come at a better time. Now I won’t have to spend a day setting everything up in the house and can just work on the patio, outside in the sunshine. Take Bell for a walk — many walks. Although Bell does get an occasional walk during the winter months, especially if the temperatures are above 35 degrees, they tend to be few and far between. With the warm weather making every activity outside inviting, walking Bell is a welcome chore. Garden planning. Admittedly, planning the garden for 2016 has not been something I have wanted to do so far this year. Every once in a while, when we’d have a fairly nice day, I’d get the gardening itch, but within a day or so the cold and snow would return and chase the itch away. Now that I can actually go out and get in the gardens to pace out new additions and plan crop rotations, the time has truly come to take this seriously. Bell has had more walks in the past two days than in the past two months, I’ve got my plan for the 2016 garden layout done, and today I finished planting all the tomato and pepper seeds I’ll need come May (check out my post at Simply Grateful Gardener Starting Seeds for the 2016 Garden). This is Michigan so accepting that snow will more than likely bury us again before spring truly comes to stay is just how it is. Having this reprieve and taking total advantage of the gift — for this I am — Simply Grateful.